Iraq appears in the grip of fresh political turmoil, as Shia parties nominated an alternative candidate as PM to embattled incumbent Nouri Maliki. The umbrella group voted for deputy parliament speaker Haider al-Abadi instead of Mr Maliki. The current PM has made it clear he wants to stand for a third term, and pro-Maliki security forces took key sites in Baghdad overnight. Mr Maliki faces calls to step down amid a jihadist insurgency in the north. Critics say Mr Maliki, a Shia, has precipitated the current crisis through sectarian policies. Sunnis, Kurds and even fellow Shia have urged him to go. But he made a defiant speech on Sunday accusing President Fuad Masum of violating the constitution by allegedly ignoring deadlines for appointing a head of government. US Secretary of State John Kerry called on the Iraqi prime minister not to increase tensions, and warned against use of force by political factions. "The government formation process is critical in terms of sustaining stability and calm in Iraq, and our hope is that Mr Maliki will not stir those waters," he said during a visit to Australia. Earlier the US, which has urged Iraq to form an inclusive government, issued a statement backing President Masum. In a separate development, US officials said Kurdish forces fighting militants in northern Iraq were "being armed by various sources" and did not deny US involvement. 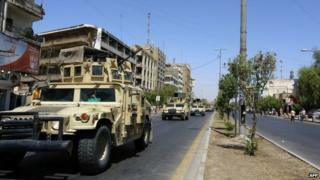 The Kurds have appealed for international military aid to help defeat the Islamists. Reports say that the Shia National Alliance has voted for Mr Abadi by 130 votes to 40 for Mr Maliki. But correspondents say Mr Maliki may still seek new alliances in parliament to put forward his candidature. "The federal court announces its decision confirming that State of Law is the largest bloc in parliament," state TV reported. But shortly afterwards court spokesman Abdelsattar Bereqdar told BBC Arabic that it had asked President Masum to choose the bloc with the largest number of MPs without naming any bloc. Correspondents say the question of how to define the largest bloc had been a major impediment to Mr Maliki's ambitions since his election victory in May. Mr Maliki had announced in a TV address on Sunday night that he was making an official complaint against the president in court. Media captionUS Secretary of State John Kerry: "We need to... give a new government the opportunity to be voted on and move forward"
He accused him of "committing a clear constitutional violation for the sake of political calculations and... giving priority to the interests of some groups at the expense of the higher interests of the Iraqi people". Mr Maliki's coalition won the most seats in April's elections but parliament has not agreed to give him a third term. US air strikes against Islamic State forces have been small-scale and localised. Now there are reports quoting US officials suggesting that Washington is also supplying weaponry to the Kurdish Peshmerga fighters. This would amount to a significant shift in US policy. Until now it has been reluctant to arm the Peshmerga for fear of accelerating a Kurdish breakaway from Iraq. This in part explains why US military action has been so circumscribed. The US is further constrained by its natural reluctance to re-engage militarily in Iraq and its desire to do as little as possible to reduce the pressure on Prime Minister Nouri Maliki to step down. Washington has made clear that full-scale US support is contingent on new more inclusive governing arrangements in Baghdad. It was a potential genocide and the threat to Irbil that forced Mr Obama to act last week. But reports emerged in northern Iraq that Islamic State (IS) militants had captured the town of Jalawla, north-east of Baghdad after weeks of clashes with Kurdish fighters. On Sunday, Kurdish forces said they had regained the towns of Gwer and Makhmur from the militants, helped by recent US air strikes in Nineveh province. The US has already launched four rounds of air strikes targeting the militants near Irbil, the capital of Iraqi Kurdistan. In western Iraq, minority religious groups, such as the Yazidis, have been forced from their homes, prompting international aid drops. Witnesses told the BBC that thousands of refugees near Sinjar had escaped to safer areas. The US air strikes have been the first direct American involvement in a military operation in Iraq since the US withdrawal from the country in late 2011. US President Barack Obama authorised the strikes last week after members of the Yazidi sect were forced to flee Sinjar into the surrounding mountains. Are you in Iraq? Are you in Irbil or Baghdad? Do you have any information or intelligence about the latest developments in the country? If you are willing to share your experiences and photos of the situation on the ground, please email haveyoursay@bbc.co.uk using the subject heading 'Iraq developments' including your contact details if you feel it is safe to do so.